This entry was posted in Elections 2015 and tagged Elections 2015 by Rik. Bookmark the permalink. b) what a waste of a newspaper column, as it tells us precisely nothing about anything important. 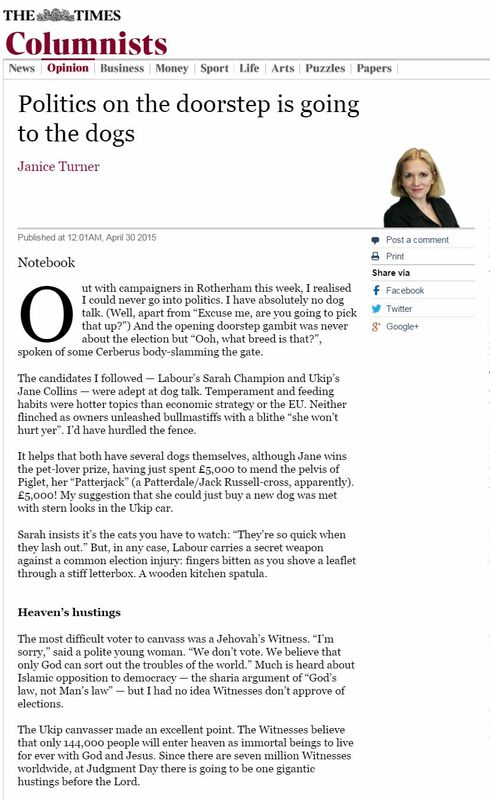 I think what it tells us is Janice Turner has probably never experienced political campaigning anywhere north of Watford and she is not a dog owner. A wimpish article penned by a wimp. She does come from Doncaster . Her coming from Doncaster is that meant to be an excuse for the lazy writing in the article, or is it an insult to the people of Doncaster. It is not even satirical, nor can it be seen in anyway an explanation of the beliefs of the two candidates. Oh, look on the bright side witnesses do not plant bombs.